Last week, I added a few new save and splurge items to my skincare routine I wanted to share. A couple months ago, I tried Lancome’s micellar water as a makeup remover/toner. It worked well, but it was also $40 and I didn’t feel like it was that good. So when it ran out I was looking for a replacement! I was at Target and picked up this bliss makeup melt. I squirt two pumps onto a cotton pad and it literally melts my makeup away. Mascara. Everything. I use my normal face wash (I rotate between Clinique (my favorite! makes my whole face feel alive! ), Proactive and an ultra cleansing wash I got from an aesthetician) and then put on this new Thayers toner I also picked up at Target. It smells like a dream (get the rose!) and so far, I’m really loving it and would recommend it! At about the same time I ran out of my under-eye cream (I was using Kiehls super multi-corrective eye pump–I am obsessed with the face cream, the eye serum was just okay) so I picked up this philosophy time in a bottle (beware, it’s $$), but I’m loving it so far. I always have puffy, dark circles under my eyes and I can already see a difference after a week. The last thing I got was this overnight bronze and glow mask. Most facial self tanners make me break out and this one has done the opposite. I really feel like my face looks moisturized and glowy–I wouldn’t say it makes my face super tan or even as bronze as the online picture suggested, just glowy and really hydrated (all plusses for me!). I layer it with my Kiehls lotion, so that could be a factor. I used to dread my nightly skincare routine, but since finishing our bathroom and organizing all of my products–I actually look forward to it every night! If you missed the tour through all of the drawers in our bathroom, you can watch it here! 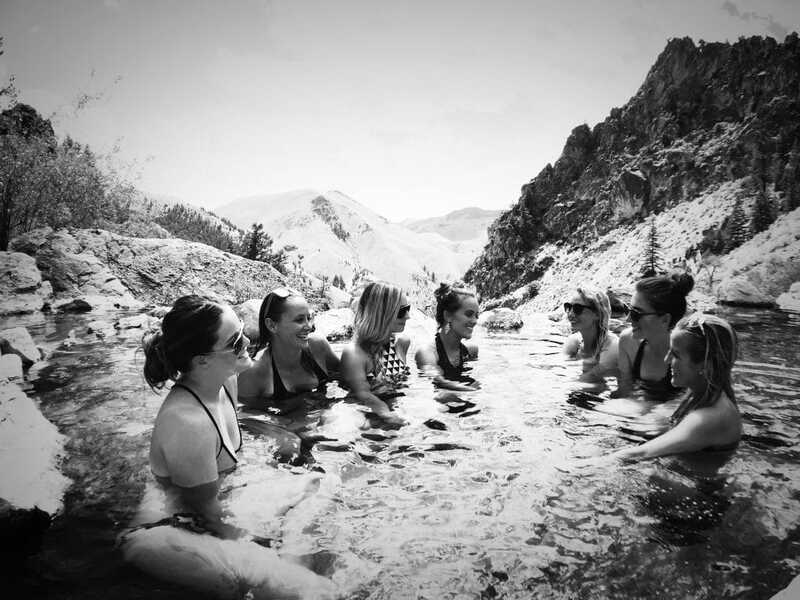 • We have a Would You Rather card game in our game closet and I was mortified overhearing our girls reading some of the cards with their friends one day. I immediately went and grabbed the game and said, “this one is just for adults, sorry!” But! The story has a happy ending because I went online and ordered this kids version, which has all the gross, sill, smelly, embarrassing would you rather questions without all the sexual ones. And! It’s bound in book form which is so much better for kids because there is no chance of losing the cards. They have been laughing hysterically and going through every question all week. 5 stars. • This outdoor shower is dreamy! • Last year we landscaped in front of our fence on one side of our property around this time and we saved the other side for this year. We brought in a professional to help us lay out what was recommended for our area and what he ended up recommending we were NOT prepared for. By the end of the conversation, I was on board and even excited but it’s still a little bit like chopping off all your hair and starting over. You can watch the whole thing go down here. • This exfoliator/body polish smells so good. It’s perfect to use pre-self tanner, but I also use it in the shower about twice a week just because I can’t get enough of it. I want to EAT it, it smells so good. 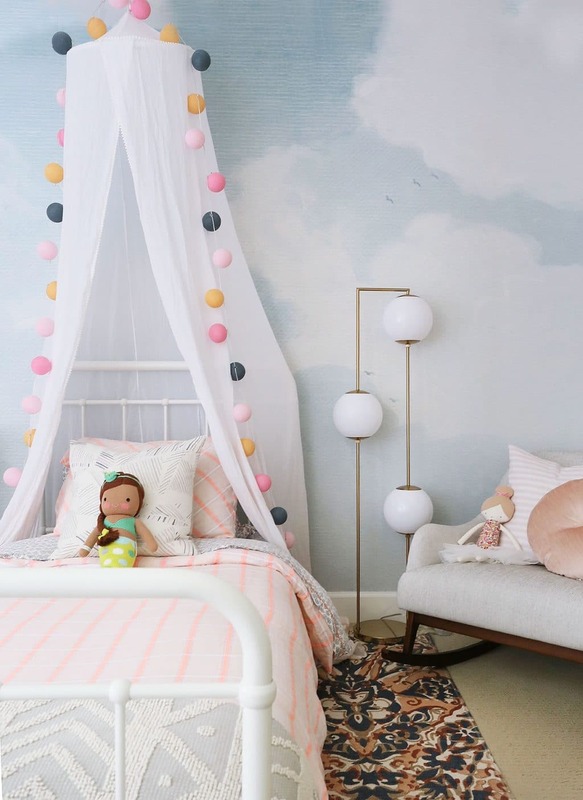 • How positively sweet is this little girl’s room by Sunny Circle Studio? • I keep waiting for this bowl to go on sale. It would make the coolest centerpiece or sculpture on a shelf or fruit bowl. Or just bowl to collect things in a very stylish way on an entry table. …I should just get it! 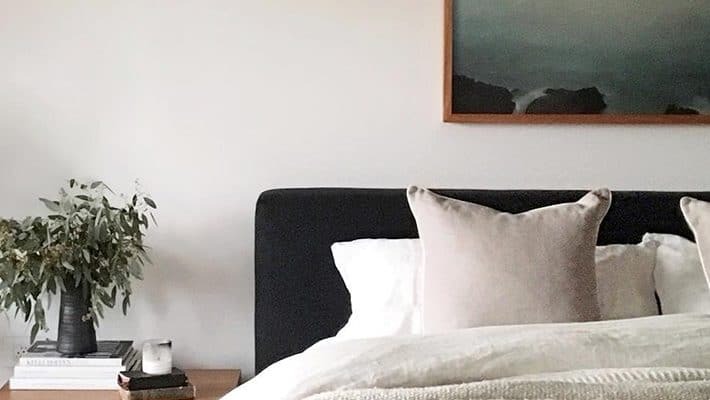 • Today only, Urban Outfitter’s deal of the day is up to 50% off all bedding! They have fun duvets and sheets, but I also LOVE to snag a cool set of pillowcases which layers a punch of pattern to any bed on a budget. A few favorites below! « Adding a Fireplace to our bedroom? Casual Friday + Our Favorite Games! Have you tried the Garnier® SKINACTIVE™ Micellar Cleansing Water All-in-1 Makeup Remover & Cleanser (also at Target)? I’ve tried all kinds of groomers from Shiseido to Neutrogena, but I love the Garnier the best, and you can’t beat the price…I just I wonder how it compares to the Lancome and Bliss you mentioned. I also love Thayers… I have pretty sensitive skin and broke out with a ton of white heads trying an Estee Lauder cleanser. I googled it and found witch hazel a good remedy so I tried Thayers. The next morning most of my white heads we’re gone! Amazing. Hahaha, yes. But I write it throughout the week as I come across something so by the end of the week, I have a whole post, although it may be a little disjointed. Chris and I are the only people that ever EVER write posts here. The purple kiehl’s is where it’s at. I bought because of you and noticed a huge difference in how my skin looks and especially how it feels. The price is worth it! Do you use a self tanner for all over? I would love to hear which one you like. I want to try one but I am scared I’ll be orange. I do! My favorite is St. Tropez mousse for an instant tan that gets darker over time. It has zero orange to it, but it will come off on your sheets until you rinse off (just the excess rinses off and leaves you with a great tan.) Right now I’m doing the St. Tropez gradual tanner that goes on like a clear lotion (doesn’t come off on any sheets or clothes) and gradually gets darker over time. It’s not as instant, but it’s also really moisturizing! You’re the second person this week who’s talked about the Thayers Toner! I need to give it a try. 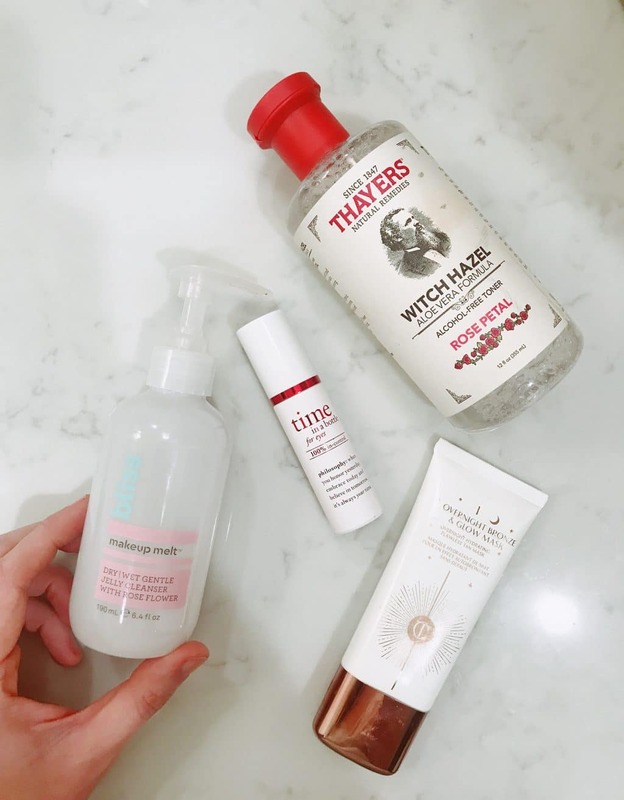 This other blogger http://www.alittlebitofeverythingblog.com/2018/08/spotlight-on-toner.html also recommended Fresh Rose Deep Hydration Facial Toner. I haven’t tried either one of them and based on the price difference, I think I’ll try Thayers first. I do love the Thayer’s rose petal witch hazel. BUT…I also bought the Pixi glow tonic at Target as well. I love love love the PIxi. The smell is amazing, and it seems to really help get rid of the facial gunk the cleanser doesn’t get to. More money, and less than half the size of the Thayer’s. But worth it to me. Also got hooked on the Acure Brilliantly Brightening facial lotion from Target. It smells amazing as well. Thinking of trying the serum as well. I second Pixi Glow Tonic! It’s amazing!